I’ll admit, when Bounty opened with another gateway to the past (featuring a posthumous Jesus cameo) after the miserable flashback-fest that was The Walking Dead season 9 episode 11, I was worried. But the follow up to last week’s misstep is a much stronger outing for The Walking Dead season 9, even if its necessity to the running plot of the show remained minimal at best. Episode 11 focuses on two unrelated substories taking place within the same day; the standoff at Hilltop as Alpha and her Whisperers seek to retrieve Lydia back, and The Kingdom’s attempts to scavenge a projector from a Walker infested cinema. The former was a tense, slow-paced deadlock designed to properly introduce The Walking Dead’s new main antagonist, while the other was a much more lighthearted, inconsequential affair, though, and Bounty struggles to avoid a tonal discord as it continually hops between the two. Thankfully, the events that transpire at Hilltop do a much better job of establishing Alpha as a person to fear. Season 9 hasn’t been great at letting Samantha Morton’s chilly performance as the big bad make an impact, but Bounty finally gives her an opportunity to dominate the screen. One moment in particular, in which she essentially orders one of her own to leave their newborn baby to the undead by way of a Jim Halpert style shrug, tells us exactly the kind of leader this person is in the space of a few minutes, and it works brilliantly. That said, Alpha still appears to be someone who wants to just mind her own business, rather than actively oppress or enter a war with Hilltop. While that’s a refreshing change of agenda compared to the likes of Negan and The Governor, you get the impression that The Whisperers are only going to play the part of the antagonist when someone on the other side instigates a conflict through their own stupidity, and that someone is almost definitely going to be Henry. I don’t get it. Does The Walking Dead’s writing team genuinely want us to hate Henry? Is his one character trait ruining life for everybody else? Should “to Henry” become a verb from now on, meaning “to repeatedly screw things up out of selfish shortsightedness”? Not only does he sneak Lydia out of Hilltop right as Alpha comes to the doorstep asking for her back, but he then heads out to rescue her from The Whisperers just as Daryl trades her for Luke and Alden. We’re apparently supposed to believe that the pair are in love after interstitially hanging out with each other for a little over 24 hours (their kiss scene, in no coincidence, felt horribly, awkwardly unearned), but AMC seems to forget that viewers have far more investment in Alexandria, Hilltop, and The Kingdom, and this burgeoning romance is posing an unnecessary risk to those communities. For all its Henry-shaped problems, the Hilltop scene did have some choice moments, including Connie’s encounter in the corn fields as she saves the abandoned baby from Walkers, only to find herself up against an onslaught from both the undead and the Whisperers. Director Meera Menon immerses us into Connie’s perspective by dampening down the sound and choreographing the camera in a panicked flurry, and while no one was expecting a death scene, it does a good job of heightening the risk posed by the character’s act of valiance. Meanwhile, Norman Reedus is continuing to prove he has what it takes to fill Rick’s boots, and this wiser, less reckless Daryl is the balm we need to Henry’s stupidity right now. "Reedus is continuing to prove he has what it takes to fill Rick’s boots." As for The Kingdom’s infiltration into a local cinema, it’s played mainly for laughs, so you can’t really fault it too much for that. Jerry is pretty much The Walking Dead’s go-to guy for comic relief nowadays, and watching Cooper Andrews sing and fight Walkers to the tune of Eddie Harris’ It’s All Right Now certainly makes for more entertaining viewing than the usual zombie tussle. Still, this entire scene feels like unabashed filler for season 9 and, other than the reveal of a mysterious symbol which seems to be setting up a future villain, I struggle to understand its worth to the overall tapestry the showrunners are trying to weave right now. All in all, Bounty was a totally innocuous, inessential chapter in season 9 that never falls completely below the line of mediocrity, but doesn’t exactly offer anything meaningful either. 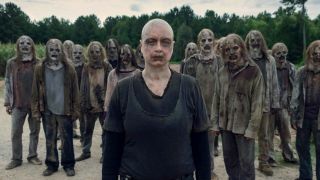 For a show that’s now eleven episodes deep into its ninth season, this lack of vitality is an unfortunate side effect to The Walking Dead’s inability to know how to quit, but hopefully AMC finds a way to pick up the steam as we gear towards season 9’s big finale. Verdict: Bounty won’t be going down in Walking Dead history as an all time great, but it’s a far cry from the lows the show has sunk to in seasons past.